The Northeast Ohio Adventures Map is a great tool when planning a trip into Northeast Ohio aka Ohio’s Western Reserve. Here the 18-county region is color coded and broken down by different icons representing Attractions and Museums, Hotels and Bed and Breakfasts, Restaurants, Shopping, Visitors Bureaus, and Other Services. This handy guide also gives you a physical address, phone number, and website to gather further information to assist your travels. 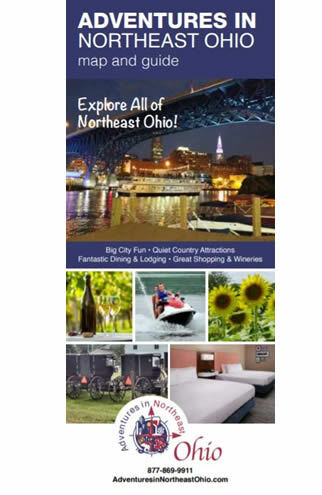 View the 2018-19 Adventures in Northeast Ohio Map & Guide now or send us a request and we will send a map by mail to you today! Need large quantities of our map? Send us a Bulk Request here.